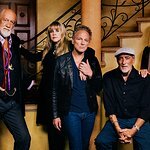 Fleetwood Mac will be awarded the 2018 MusiCares Person of the Year on January 26 in New York, and the first performers at the tribute concert have been announced. Lorde will head a list of artists that also includes John Legend, Keith Urban, Harry Styles, Haim, and OneRepublic. Fleetwood Mac – Mick Fleetwood, John McVie, Christine McVie, Lindsey Buckingham and Stevie Nicks – will also perform. This will be the first time an entire band has been honored with the award. The event will also include an auntion, and after party, and more.